In 2011 the Lifeforce Foundation wants tighten regulations on the whale watching industry. “If Ottawa wants to prevent the extinction of one of BC’s most-loved animals, it must adopt these regulations that the UVic Environmental Law Centre has drafted,” Peter Hamilton of Lifeforce, unveiling a comprehensive package of proposed legal provisions to protect whales. If you haven’t already done so please consider making a donation to help Lifeforce continue to protect endangered species. 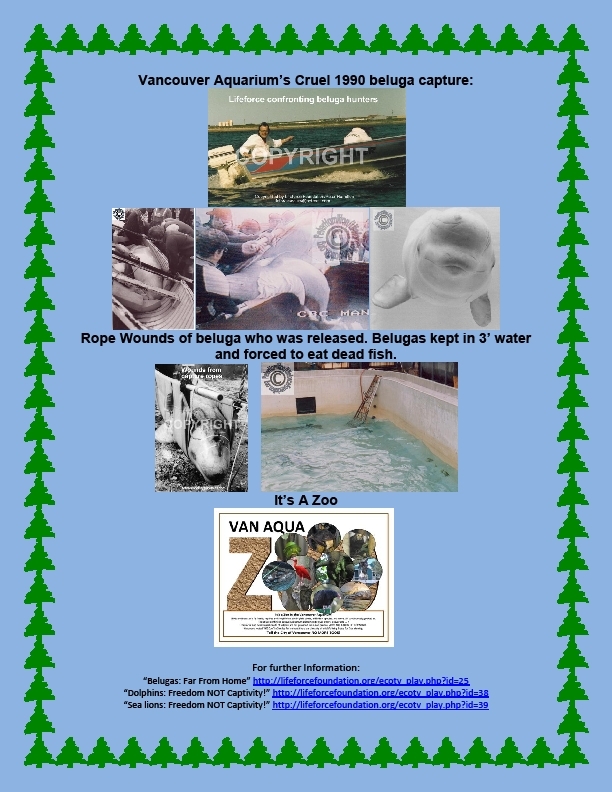 In stark contrast to the Vancouver Aquarium’s “Magic of the North” advertisements the captives at the Vancouver Aquarium are isolated from their families and deprived of their freedom in the wild. For example, for 2.5 years the father and companion beluga, “Imaq”, has been confined in a barren holding tank out of public view. The Aquarium will soon be sending this father of “Tiqa” to a US Sea World for breeding bucks. 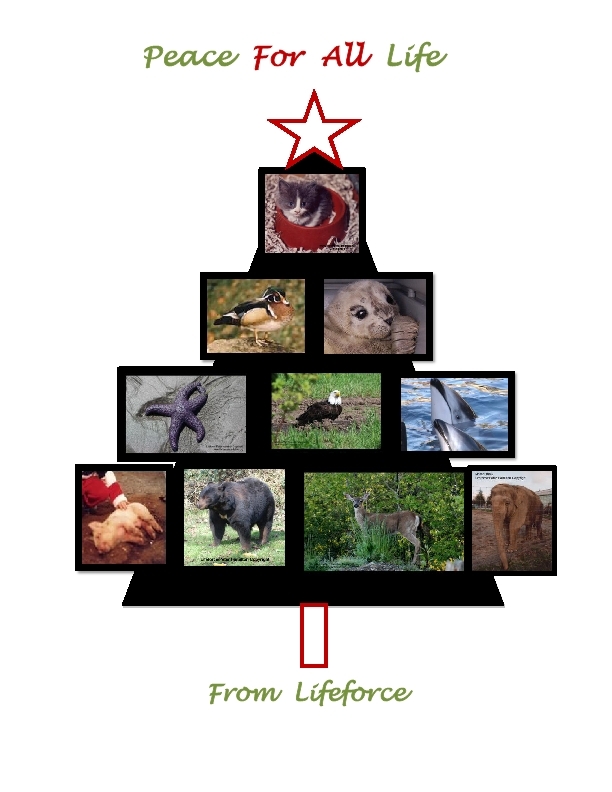 Lifeforce hopes that all life will enjoy festive, safe and humane holidays. In addition, caring and respecting all life should be a part of our lives throughout the year. Please consider making a donation to Lifeforce to help us continue our important work. As previously stated the Vancouver Parks Board has decided to finally close the Stanley Park “Farmyard” in January, 2011. This could stop perpetuating the petting zoo industry cycle of abuse and will end the Board’s last zoo animal business in Stanley Park. Closure of Stanley Park petting zoo is victory for animals. Thanks to all who have supported the work of Lifeforce. Lifeforce contacted many individuals and organizations to find permanent non-working, non-breeding retirement homes. We are disappointed that many of these legitimate rescue groups... and sanctuaries were not used. Now it was discovered by the Vancouver Sun that animals ended up at auction. Surely the Trevor French’s “meat” business could h...ave been discovered with a simple internet search. The animals’ blood is also on the former petting zoo staff’s hands who approved him. Lifeforce had urged the Board to have written agreements that would guarantee the animals' safety. This was the first time that the Board agreed. In the past many were abused and sold for slaughter. From 2000 to 2009 there were no contracts for at least 65 animals and at least one person dealt with the Fraser Valley Auction. As we suspected, most zoo “homes” were not forever and numerous “families” were broken up (“Stanley Park Children’s Farmyard List of Acquisitions & Dispositions available) For the closure of this petting zoo, it was the first time for legal agreements. No contracts from the time of my 1988 investigation to last year. And the total 113 animals (from 2000 to 2009 alone) is a lot of animal traffic. Why did Lifeforce have to fight for this if the staff really cared? It is commendable that the City is pursuing legal action against the person who sold animals for food slaughter. Lifeforce had urged them to finally have written contracts to provide a permanent non-working retirement home. For decades there were no guarantees. The Board should have only dealt with legitimate farm sanctuaries. However, this must cover all improper care and mistreatment of animals – before and after adoptions. There are skeletons in the Board’s closet too. Lifeforce must wonder why the requested animal records were not provided. Lifeforce will continue to conduct a full investigation of the Park Board Staff and Management who were responsible for the care and well being of animals. 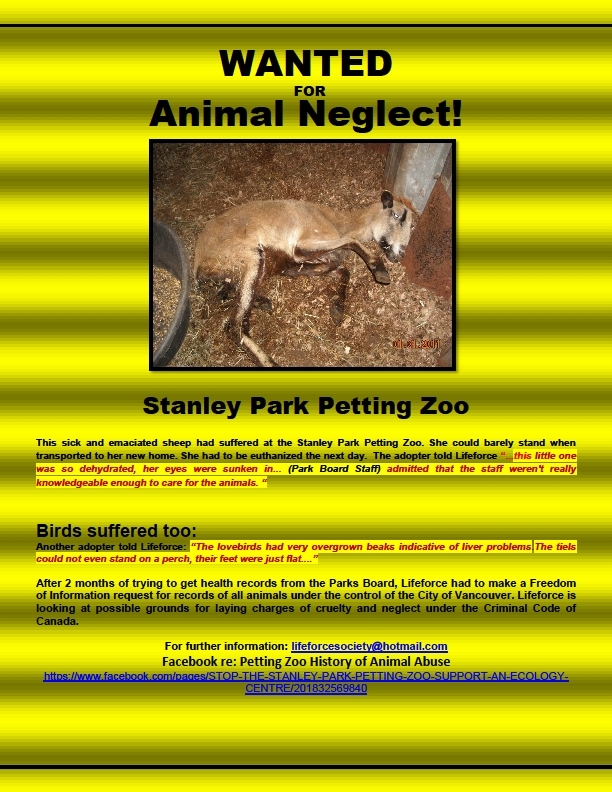 If the reports of neglect and poor treatment of animals, who were in the former petting zoo, are substantiated then criminal charges should be pursued. I attach a “Wanted” poster of the sheep who suffered. As stated, this poor animal was in horrific condition when received from the petting zoo. Well some folks may celebrate the 100th Anniversary of the Pacific National Exhibition we must not forget its legacy of animal rights abuses. Georgia Straight Commentary "PNE Not Fair To Animals". Following the death of a beluga at the Vancouver Aquarium, park board commissioners will once again debate if voters will finally be allowed to stop the inhumane cetacean imprisonment. 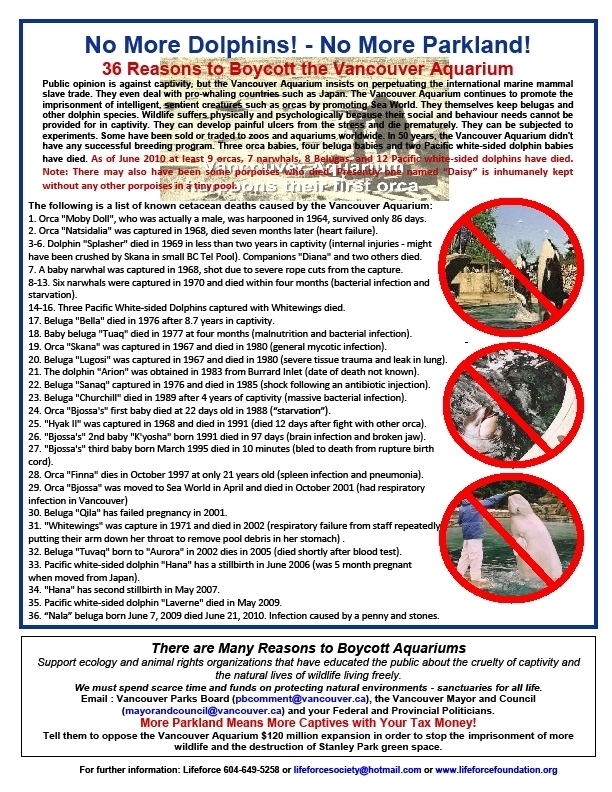 An aquarium captivity plebiscite in 2011 shouldn’t be questioned! It should be a right in order to protect animals and voters. All elected Vision Vancouver and COPE politicians must now support Green commissioner Stuart Mackinnon’s proposal to begin a process to phase out the imprisonment of dolphins. They must not be intimidated by the Vancouver Aquarium. Lifeforce fought hard to have the Stanley Park Zoo expansion issue put to a vote during two civic elections in 1990 and 1993. Twice the people said “No zoo in Stanley Park!” and the NPA finally stopped trying to railroad it through. There is no difference between the pacing polar bears and the dolphins swimming around and around and around. The Vancouver Aquarium’s dolphin prisons and zoo shows must be stopped. There is no educational or scientific justification for keeping dolphins in confinement. It is life and death in a toilet bowl for captive dolphins. They are deprived of their psychological and behavioral needs. They swim in tiny pools polluted with their excrement. They are deprived of freedoms that are only provided for in their ocean homes. It is tantamount to a person spending their life in a bathroom. Most of the belugas were captured in the wild. The Pacific white-sided dolphins were deemed to be unfit for release by Japanese aquariums yet are physically able to perform all the stressful, difficult tricks. There are dolphins surviving in the wild with far greater injuries. The Vancouver Aquarium is not a leader in conservation. They do what is profitable. They have been part of the problems not the solutions. They bragged about having the first captive orca who didn’t die when harpooned to be used as a model for a sculpture. Their insensitivity, in fact, resulted in the decimation of local populations now designated as endangered species. They also want more dolphin deals from a country that notoriously opposes international whaling bans. Japan’s “drive fisheries” to kill dolphins for food and aquariums were exposed in the Oscar-winning documentary The Cove. The Vancouver Aquarium continues to send dolphins to U.S. SeaWorlds that exploit orcas and others for entertainment. They have already sent wild-caught male and female belugas while they are presently waiting for a permit to send their last male beluga. The seal pup rehabilitation can be done without dolphin captivity. Other international well-respected wildlife rehabilitation centres have done so for decades. All the slick “conservation” advertising fails to reveal that the Vancouver Aquarium has only joined other long-standing programs, such as beach cleanups and eating sustainable fish, while turning the Lumberman’s Arch picnic grounds into a office trailer park and garbage dump for the proposed expansion, and while serving up abused farm animals that contribute to global warming in their cafe and at parties. So it is wake-up time for some of the public and politicians who need to be reminded of the cruelty and public opposition to exploitation for so-called entertainment. There have been at least 36 deaths of dolphins as a result of this business. The public said “No Stanley Park Zoo!” and it was closed. The rodeos and exotic animal circus acts in Vancouver were also stopped. Existing captives who were captured from the wild will probably not be returned to their ocean homes. Sadly, they and those born in captivity will die prematurely. But at least that will end the Vancouver Aquarium’s legacy of violations against nature. On July 19th the Vision Vancouver and NPA Commissioners voted against a Plebsite. The Green Party and Cope voted for it. There are numerous untrue statements made by pro-captivity writers. The Aquarium Industry's propaganda is full of misinformation and half-truths. The Vancouver Aquarium spends a lot of money ads and advertising spin doctors. Animal protection groups struggle to get the truth to the public. For example, the cetaceans would not be “dumped in the ocean”. The imprisonment of belugas and other dolphins will be phased out. Some will die there and some will be relocated (perhaps some wild caught ones will be sent to sea pens to study reintroduction). Any injured cetaceans needing rehab can be kept in a sea pen at the nearby Aquarium’s station on Popham Island. The alleged public support of the proposed $120 million expansion was based on misleading information. The public thought it was bigger pools for the existing cetaceans. They were not fully aware that many more dolphins will be imprisoned. They were not told that more otter pools were not just for the sea otters but to capture river otters from the wild. When the public voted for No Zoo in Stanley Park! part of the opposition was because of the cruelty of confining the river otters. If people are given facts about the physical and psychological suffering of cetaceans they would say No More Cetaceans! 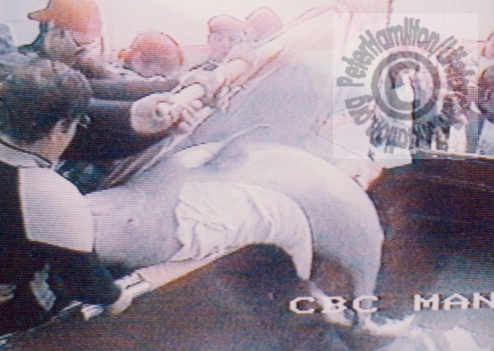 The Cetacean Bylaw must be changed to truly stop the imprisonment. The Aquarium expansion must be stopped. More misuse of park land means the acquisition of many more dolphins and inhumane zoo exhibits. Politicians must keep their election promises to stop the Aquarium expansion! In May 2009 Lifeforce started a letter writing. 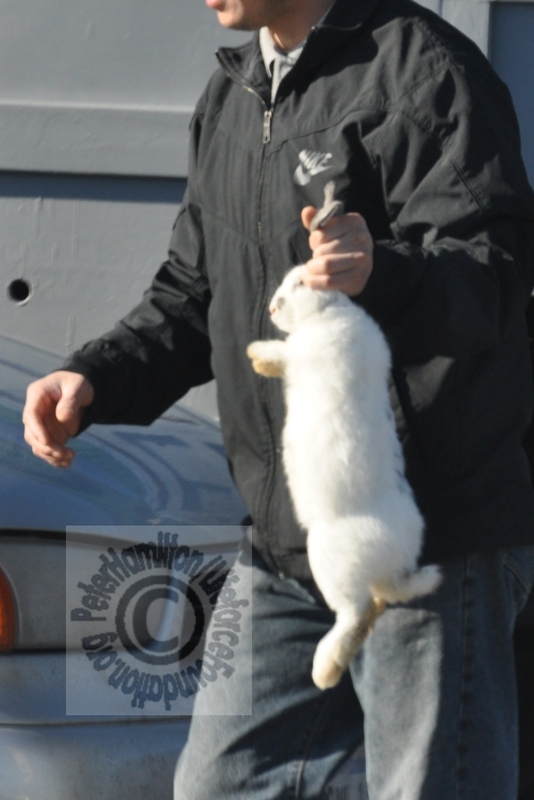 Several requests to DFO asking if the kill was approved were not answered. The Nuu-Chah-Nulth Tribal Council in British Columbia wanted to kill at least 20 sea otters every year for “ceremonial” purposes. Permitting a sea otter slaughter is not only cruel but opens the door to the killing of other marine mammals such as whales. Thank you to all who wrote to the Canadian Fisheries Minister. It has stopped the slaughter of sea otters. The physical and psychological needs of these intelligent, social dolphins cannot be provide for in aquarium prisons. It’s life in a toilet bowl for them. This baby was reported “sick” for two weeks and then died from respiratory failure. There was foreign matter (two rocks and a penny) lodged in the whale's airway. The airway became inflamed, leading to an accumulation of fluid in Nala's lungs. In 2002 a Pacific white-sided dolphin died of respiratory failure when staff repeatedly put their arm down the throat to remove pool debris/foreign matter from the stomach. Since pool debris is a major problem with captive dolphins the Aquarium should have been more thorough in their medical examinations. In addition large signs should have been posted warning visitors of the obvious endangerment of the belugas if objects are thrown into the pool (According to some media no signs were visable on June 22). It is also irresponsible to allow the public to get close to the belugas and other captives.Aquatic zoos must have barriers similar to zoo ones. The Aquarium dolphin breeding programs have been a failure since beginning in 1964. No successful orca births (3 died) and no successful Pacific white-sided dolphins. Now four of six baby belugas have died. In addition, if the baby(s) survive, then families are split up. The father, Imaq and a female, “ Kavna” are kept in a tiny pool out of public view. Lifeforce has been trying to stop the Vancouver Aquarium from sending the father, Imaq, to the infamous US Sea World entertainment business. The Vancouver Aquarium should stop their exploitation of belugas and other dolphins. Their captive dolphins continue to suffer and die prematurely. 1. To urge that all dolphin imprisonment be phased out. 2. To attempt to stop the export of the only male beluga from the Vancouver Aquarium to the infamous Sea World entertainment business. 3. To campaign to stop the $120 million Vancouver Aquarium expansion that would imprison more dolphins and other animals such as river otters. It was planned for the 2010 Olympics. See: Previous June 2009 Beluga Birth Statement. See: Globe and Mail artcle Activist Criticism. Video: Belugas: Far From Home. 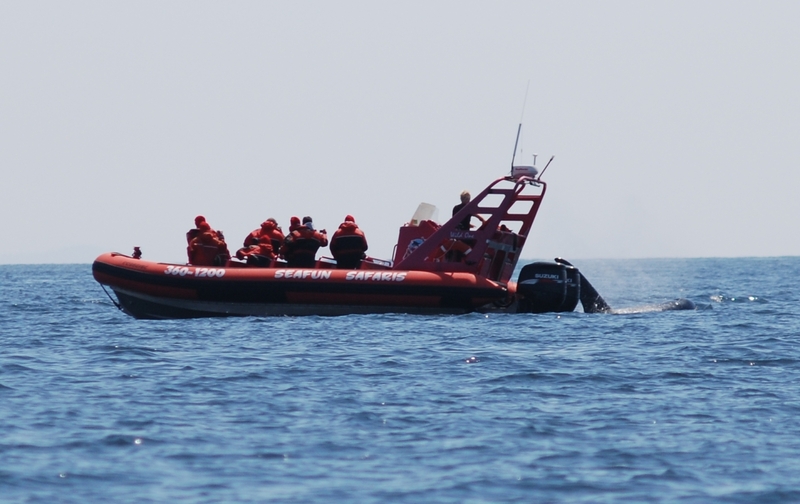 The Canadian Coast Guard is being criticized for routinely roaring its hovercraft through important feeding habitat for harbour porpoises off Point Roberts, Wash., just south of the border with B.C. The harbour porpoise is a shy marine mammal and a candidate for listing as threatened or endangered by Washington state. Peter Hamilton, founder of the environmental group Lifeforce and an observer of vessel and marine life interactions off Point Roberts since 1993, says there is no justification for the coast guard's continuing actions. Boat traffic has a negative impact on the lifestyles of orcas. The continuous boat presence interrupts their lifestyles that include foraging. Starved orcas rely on their fat reserves that contain toxic pollutants. This ongoing stress can make them sick and more susceptible to illnesses. More enforcement is needed so existing and any improved laws are adhered to. 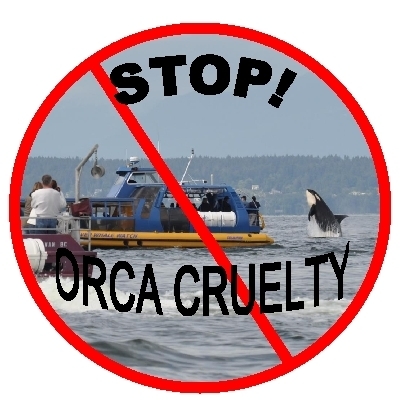 Please email Gary Locke, US Secretary of Commerce (TheSec@doc.gov) to increase orca protection by the Washington Department of Fish and Wildlife in 2010. In Canada contact Minister Shea (Shea.G@parl.gc.ca). Donations are greatly appreciated and can be sent to Lifeforce, Box 121, Point Roberts, 98281 or Box 3117, Vancouver, BC V6B 3X6. Thank you. New Lifeforce Campaign: Stop Vivisection Canada! Requests for information to universities and the Canadian Council on Animal Care (CCAC) have been denied. The CCAC was incorporated as a non-profit and independent body in 1982. They manage a voluntary control program. In Canada taxpayers and donors cannot get information that is available under federal disclosure laws for US vivisection laboratories. This includes information about the research laboratories, the experimental procedures, the number of animals and the copies of CCAC inspection reports. In addition, the US Animal Welfare Act mandates research standards. In Canada i t is out of sight, out of mind for the multi-billion dollar vivisection industry. The Canadian government must permit greater access to Information about vivisection and implement a phase-out plan to appease all. A Lifeforce on line Canadian Whistle Blower notices about how to report abusive experiments with animals and people. Here’s an introduction to “What is vivisection?” and who profits from it. This is a challenge to open the labs to show the public ALL experiments on animals. Let the public decide. It has always been the goal of Lifeforce to show people what happens behind closed doors. The taxpayers and those who donate are entitled to the information in order to make informed decisions. 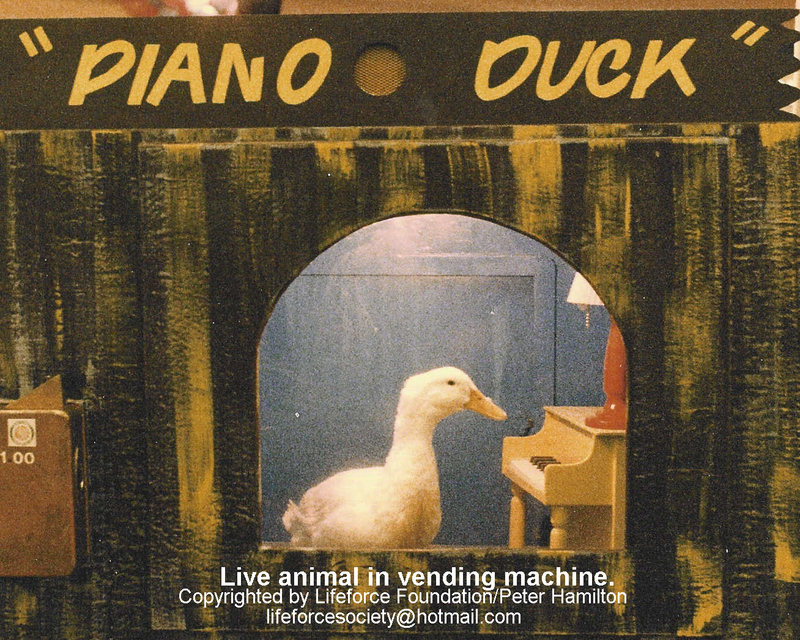 The Lifeforce post card campaign urges politicians to give taxpayers greater access to vivisection information and to set a goal of 10% reduction of “animal models” annually. Canadians can send this On-Line Postcard to their Federal Member of Parliament and Provincial Government politicians. Post cards will also be available at public events for Canadians to send to their MP at no cost. 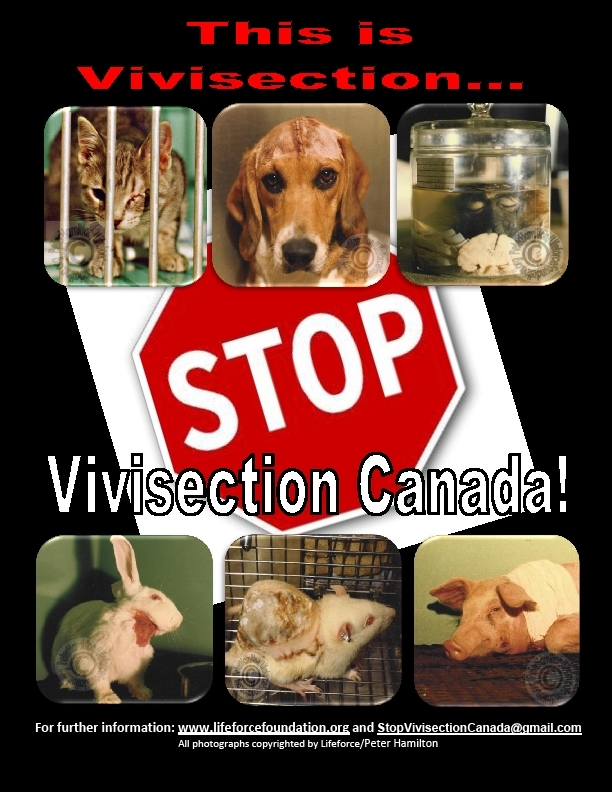 See POSTCARD – Stop Vivisection Canada! The Stop Vivisection Canada post card should also be sent to your Provincial politicians. You can simply change the Dear MP. Just Google your Provincial Government to find your representative. And please pass the post card on to others. I urge you to protect people and animals. An inadequate peer-review process governs animal use in science in Canada. Stop the increase of animal experiments by phasing out at least 10% annually. Until then the government must provide greater Access to Vivisection Information as done in the US. The use of “animal models” of human maladies is inhumane and scientifically fallacious. First, the actual human illness or injury is not being studied. Fake injuries and/or symptoms are artificially induced into the animal model. Secondly, animals respond diferently to methodologies tested between and within species. This phase out period will give notice to the vivisection industry and save scarce health care funds. Will you support Cruelty Free Research? Auction Abuses: No Way To Treat Animals! This is no way to treat animals! On June 4, 2008, following a one year investigation of the Fraser Valley Auctions in Langley, BC, Lifeforce released our report “Lives for Sale” for review and action. The report and the video clearly depict ongoing violations of Federal and Provincial Regulations/Guidelines (that are supposed to protect human health and animals) and inhumane treatment of animals. These inherent, callous conditions must be stopped. During recent Lifeforce inspections we have found continuing problems. We have sent an Open Letter to government officials and the BCSPCA. Lifeforce , a Vancouver-based ecology organization, will be requesting that officials conduct an inquest into the recent death of Dawn Brancheau a trainer at SeaWorld Orlando. Lifeforce hopes that a legal investigation will help prevent human tragedies and the exploitation of orcas. An inquest hearing was held in Canada into the death of Sealand employee Kelti e Byrne in 1991. The same orca, Tillikum, caused her death. Lifeforce made several recommendations including stopping any further contact with Tillikum and the other two orcas. Lifeforce told them that it is likely that Tillikum would attack again. Now he has caused a third human death. In captivity orcas and other cetaceans are deprived of their behavioural and social freedoms. Confinement in aquarium prisons results in psychological harm resulting in neurotic, aggressive behaviours. Captivity can drive them insane. At Sealand of the Pacific, Victoria, BC the three orcas were inhumanely confined every night in a “holding module” that was approximately 25’ x 30’ (Photographs and video available). 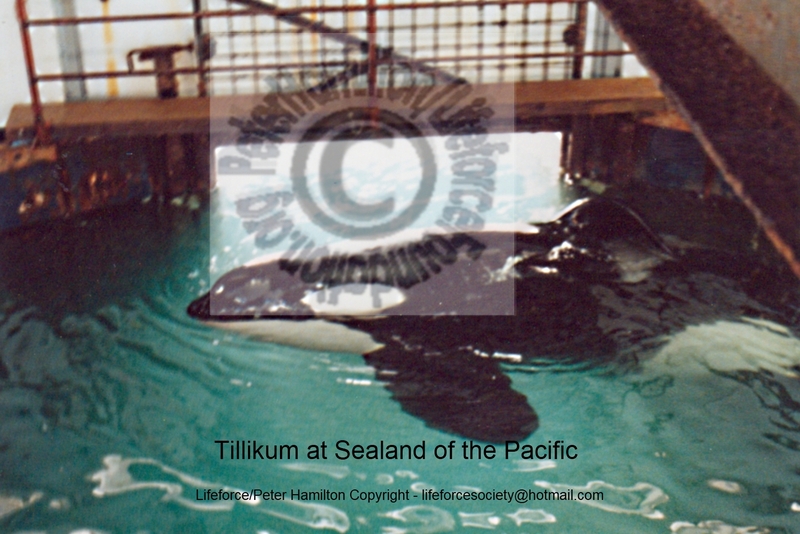 There was a history of psychological abuse to Tillikum. There have been many attacks on humans by captive orcas. But there have been no attacks by wild orcas. There were some very serious employee injuries but hush up orders/financial settlements kept a lot of it quiet. This also applies to swim with dolphin programs in which there are numerous dolphin aggression problems. Petting and feeding attractions also present public safety risks. B.C. businessmen Joel and Danny Nagtegaal were drinking beer and decided last spring to buy one goat for a poor family in Africa each time the Vancouver Canucks won a playoff game. Other Vancouverites decided to do the same thing and 1,073 goats were purchased for African families. Now, the brothers plan to buy a goat for an African family every time a Canadian wins a gold medal. We must send poor Africans healthy food, water filtration systems, medicines, seeds, tools, books/education supplies and other donations that help them without causing animal abuse. 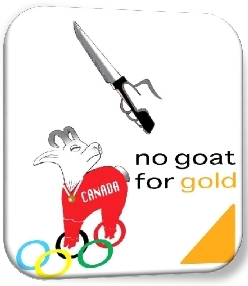 See our Facebook "Goat For Gold No!" On January 6th it was the 20th Anniversary of the Lifeforce rescue of a rat that an “artist” was going to crush to death. 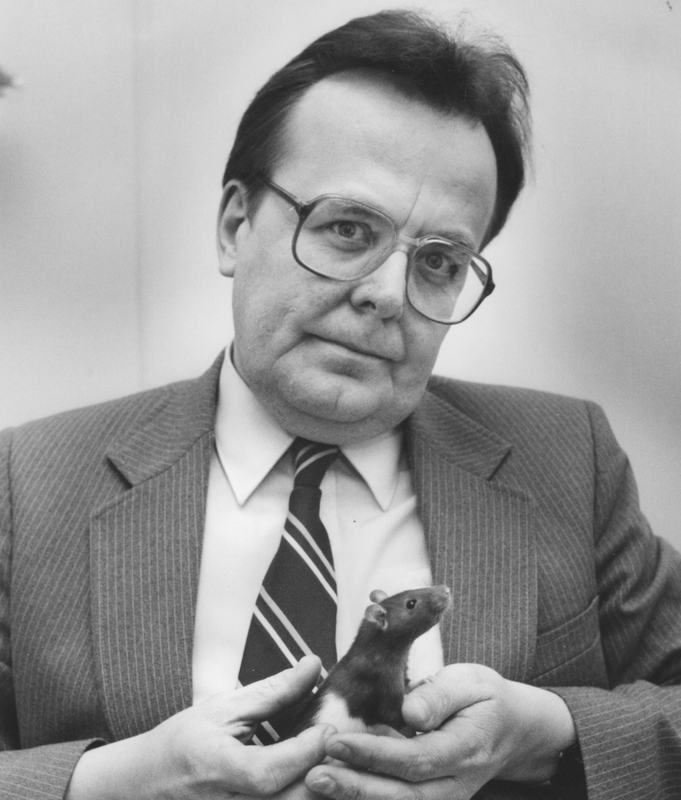 In 1990 Rick Gibson said that he would crush a rat named Sniffy in the name of art. Society must not condone promoting violence and cruelty in our society and to other sentient creatures. Killing animals is not art - it is sadistic. Speciesism is as abhorrent as racism and sexism. A speciesist has no ethical boundaries and does not draw any moral line between a bug or a bunny or a beagle and, for that matter, a human. Violence perpetuates violence. Violence towards animals also leads to violence towards people. Where will it end if society permits this? It is an indecency to animals and people. On January 6th CBC Radio in Vancouver interviewed Rick Gibson and Lifeforce. During the interview Gibson admitted that he would have killed Sniffy if Lifeforce didn’t confiscate his equipment. His “rental” of the rat raised questions as to if was actually planning to kill Sniffy. Now his intentions are clear.